Check out these maintenance tips to ensure a long life for your dishwasher! The dishwasher is truly one of the most convenient aspects of modern living and a must-have appliance in your kitchen. Not only does it get your dirty dishes clean in a fraction of the time it takes to wash them by hand, it also consumes less water and uses less energy from your water heater as well! Just like any appliance, though, you’ll notice as time goes on that your dishwasher isn’t quite performing at the same level that you’re used to. Or, perhaps, you’re starting to notice a bad smell coming out of it. 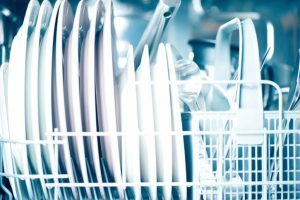 There are a few maintenance tasks you can do to ensure the longevity of your dishwasher. More likely than not, your dishwasher will outlive the rubber gasket that forms the seal around the door. When this gasket dries up and cracks, it can leak water all over your floor and on your cabinets. The user manual for your dishwasher should have replacement information in it, or you could call your local professional plumber to have these repairs completed. The bottom of your dishwasher has a screen that is designed to catch large chunks of food and loose silverware from clogging up your plumbing. To avoid odors and ensure good flow, this screen should be removed and cleaned every so often. Most dishwashers feature at least two removable arms lined with spray nozzles that should be taken out periodically and cleaned. Soak these in warm, soapy water for a time and then use a small brush to clean each nozzle. Mold and mildew can become problems in a dishwasher, but luckily this problem is easy to treat. Pour about two cups of white or apple cider vinegar into the empty dishwasher, then run it on its heaviest setting. Ensure that the bottom of your dishwasher is flat by using a level. If it is not, adjust the legs until it is. An uneven dishwasher is not as effective as it could be and could lead to drainage problems. This entry was posted on Thursday, March 16th, 2017 at 7:43 pm. Both comments and pings are currently closed.